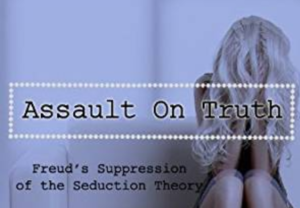 From Indybay: “Over 100 years ago, Freud became aware that many patients had been sexually abused as children, but was forced to abandon this belief due to rejection by his professional peers. I interview author Jeffrey Moussaieff Masson about this still-taboo subject. Q. With all the attention now being given to sexual assault as a result of the MeToo/TimesUp movements, there is also a growing awareness that the problem is not simply with the perpetrators of these crimes, but also with the people who enable, deny, or cover up the crimes. Based on your investigation into Sigmund Freud’s private letters, do you think that Freud’s body of work needs to be reconsidered in terms of these new perspectives? JMM: Of course there is a whole literature about patients who were hurt by Freud because he did not accept their reality. […] Like any therapist, and it is as true today as it was then, Freud was the victim of his own prejudices and his own areas of ignorance. He insisted on imposing these deficits on his patients, because he believed he was ‘well’ and they were ‘sick,’ so they had to accept his interpretations. This has not changed in one hundred years, and that is why I wrote my book Against Therapy. The most egregious case, in my opinion, is the woman who told Freud she had been savagely raped by her father at age three, and nearly bled to death. Anna Freud refused to publish the letter in which Freud recounts this terrible tale to his friend Fliess. I put it back into the public record. This is a must read and so relevant to what is happening today related to the “Me Too” Movement. In fact, Freud’s legacy is very connected to the historical perpetuation of patriarchy in its worst forms today. Actually Richard and somewhat contrary to the article, I read and was taught it was not Freud who censored his patients it was the Medical peers and Psychoanalytic Socities that discredited Freud and in order to continue on in good graces he was forced to retract some of his work in that area. It must have haunted him. His culture and religious background could, may have been problematic in view of the historical events in Germany before he fled to England. No matter what, it was an immense tragedy all aroun for everyone. Please read the article referenced above. Freud was a coward who betrayed the truth and these women to advance his career. And this ended up betraying and harming millions of women in subsequent years. I understand your anger and he didn’t have the guts to stand up to the powers that be this enduring horrible harm for generations of women. But one has to acknowledge that he did see it but surrcombed to the academic powers. If he had not been Jewish maybe it would have been different. I don’t know and we will never know. I just like to a full view to everyone and acknowledge efforts even if deliberately stopped. One of the problems of history is that it is mainly written by the victors and so much important stuff is deliberately or randomly lost. All sides should be recorded and discussed even though the yuck favor or really really legitimate outrage is felt. My father would read books on folks he did’t like – buy them in fact, so I like to have a 360 view of things. Very dicey and painful at times but for me there you go. I enjoy your comments and thinking. Your voice is an important part of the mix – every voice is and deserves to be heard though ah at times for me, they can still be triggering from my past life of so called treatment. Thank you for those very meaningful thoughts. I appreciate your voice as well. Having had “therapy” from a male psychologist (1988) and a male psychiatrist (2004-2007), both of whom subscribed to Freud’s theories (explained them to me, in fact, as FACT! ), I can personally attest to the unspeakable harm and trauma those theories, and the treatment they give rise to, result in. The material in this article NEEDS to be very widely distributed, and the letters referenced NEED to be published in psychiatric journals and incorporated into psychiatry and psychology training so Freud’s work cannot do further harm. He needs to be remembered as a fraud who actively perpetuated the abuse of women and children. It is my understanding that his withdrawal of the trauma theory was made under great pressure from his colleagues and Victorian society in general. However, we can’t absolve Freud of his decision to create a confusing and dishonest counterexplanation that served to baffle and mislead the public and the profession for generations. His cowardice in the face of social pressures had enormous negative consequences for millions of people. This is so terrible. I had not heard of it before. Thanks for the article. An educational piece — but in terms of finger-pointing, the “cowardice” of Freud’s recanting his analyses under pressure is demonstrated DAILY by ALL shrinks who redefine basic human reactions to oppression as “mental illness,” rather than confronting human suffering as a political issue.